I remember this scene from several years ago. It is right off of a main road close to my house. I have been itching to try to photograph it for about a month now. The only problem has been that the lens that I have needed has been in the shop. In order to get both the tree and the barn in the image, I needed a narrow focal length in the area of 100mm so that the barn didn't fade into the background. With my 70-200mm f/2.8L back in my bag, it was time to try it out. After many days of very blah empty skies, there was the chance of some passing clouds this afternoon. 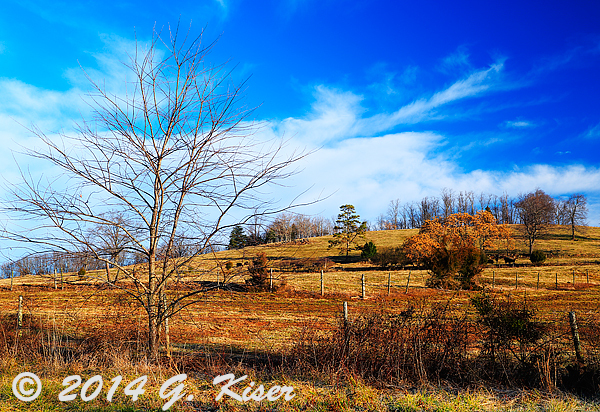 I was hoping for a nice blue sky with some golden toned clouds passing over the scene. I was even thinking about doing some long exposure work with this scene. As the day progressed the clouds came in, but they were very thin, and didn't have the texture that I really wanted. However, as sunset approached, there were some breaks in the clouds that I thought I might be able to work with. At the last minute I grabbed my bag and ran out the door heading about 7 miles down the road. I wasn't sure if I was going to get anything or not, but if not, at least I wasn't out too much time or energy. I arrived at the location and was greeted by the warm sun bathing the landscape with its warm hues while the sky remained unchanged. I quickly got my camera set up on the tripod with the telephoto lens on. 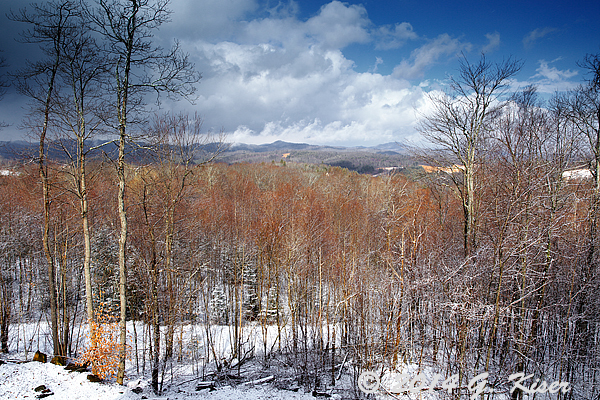 I also added the Singh Ray warming polarizer to help accentuate the warm tones I was seeing. I framed one shot and snapped a quick shot as the lighting was ever changing. I then moved to a little different location and tried to frame a different composition that flowed a bit better. I was able to do so with the last bit of light still on the tree and the barn. I was also getting some interesting shadows stretching across the frame which added to the sense of depth. In about 20 minutes I had cranked off 18 frames with slightly different compositions and widely different lighting conditions. Sensing that the sky wasn't going to do much more changing, and having lost the warm glow on the ground, I packed things up and got back in the truck. Much to my dismay, the actual sunset was a very pretty one, that would have worked very well with a body of water in the foreground. Alas, I was in no position to try and find a suitable location from where I could photograph this sunset. I will just have to be happy that I was able to see it, and experience it. I would like to try this location again with some different lighting though. I still have a few more months before the tree loses that certain something in its bare state. There is just not as much visual interest in a large singled out tree when the leaves cloak its skeleton. After doing some thinking about this picture, I wanted to go back in and reprocess it. My main goal was to process it as a monochrome image to see if my vision would still remain. Ironically, the steps that I took to convert it to a B&W image also made it a better color image. Who'd-a-thunk-it? Well, I have added in the new image, and replaced the original one with what I think better represents what I saw in the field. I have been patrolling around this area for years at work and have been by this old homestead many times over the years. I have even seen this tractor, but haven't really seen it as a photographic subject before. As it turns out, a couple of days ago, I was talking with one of the family members of the property owner and he was telling me about how he grew up and worked the land out here when he was a kid. 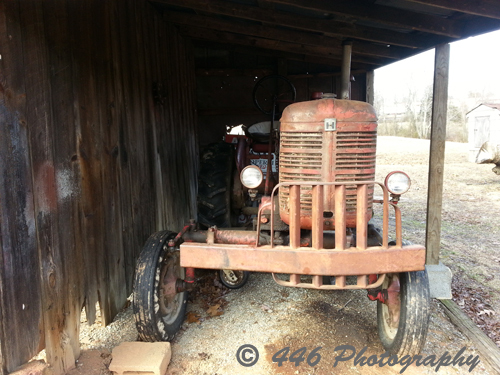 I heard stories about him on the old Farmall tractor loading hay by himself. He would leave it in low gear and let it idle by itself while he did what needed to do with the hay. If it started to get off line, he would have to jump back on and correct the path before returning to the hay. 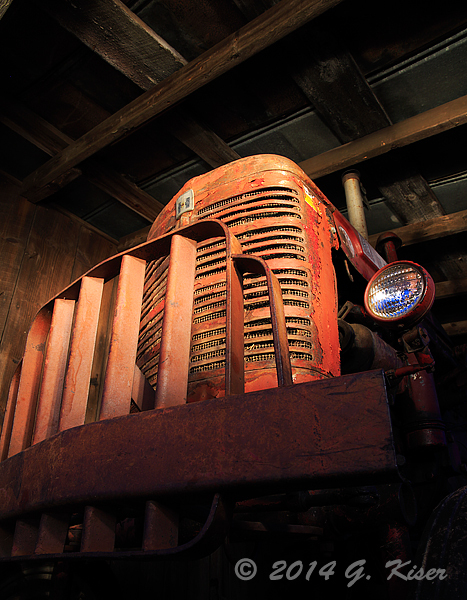 All of a sudden, after hearing this story, the tractor came alive for me and ignited my interest. The problem with this tractor is its location. It is under an overhang from an old barn where it just fits inside. This means that lighting is difficult at best with the shadows involved. To get the shadows exposed correctly, I would have to sacrifice the highlights on the outside of the barn as in this cell phone picture I snapped while scouting the location. During the day, the nose of the tractor is hanging outside of the shade which again introduces issues with the shadow detail that I think is absolutely necessary for the image. I had to do some thinking about how to properly render this image. My best thought was to come out before dawn, so that any light that I would be getting from the sun would be low, and potentially able to provide some lighting into the shadows. I was going to have to get in close, and come up with some very creative compositions in order to eliminate the outside as a distraction. I knew that in low light, I would still be at a loss when it came to the shadow detail, so I figured that I would do a little painting with light. The warm light from an incandescent flashlight should complement the wood tones of the barn siding quite well. I had my plan, I just needed my day. That day just happened to be my first day off. The forecast was calling for cloudy skies early on so that would help to diffuse the light and potentially extend my time for this subject. It was going to be cold, and actually get colder as the morning went on, with a pretty significant wind chill to add some interest. When I left the house it was 27 degrees, by the time I got home it was 21 degrees...that was over the course of maybe an hour and fifteen minutes. I arrived at the old farm long before the sun was over the horizon, but with the clouds, I wasn't likely to see the sun at all. It was pretty much still dark when I was getting my camera bag out of the truck. For the first time this winter I pulled out my photographer's gloves and put them on as my hands were already stinging in the wind. I got the tripod set up and with the help of my flashlight, I framed the shot that I thought I had in mind from the previous day. I dialed in the focus and guessed at my needed depth of field. I then set the shutter for 30 seconds which would give me enough time to provide all the light that I was going to have available for the image. 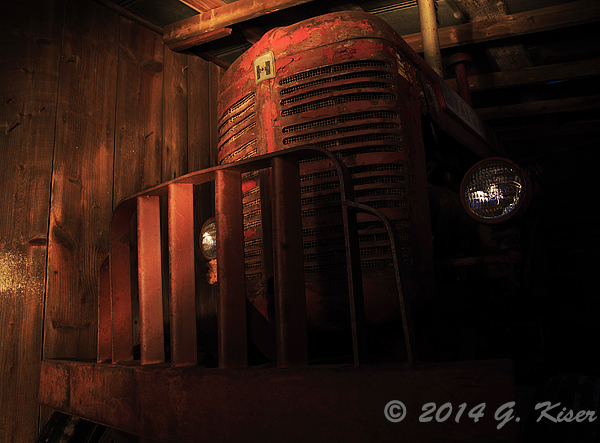 In the 30 seconds, I put a lot of light on the walls, and did a quick wipe over the tractor itself. The resulting image (first exposure of the day) is seen above. The effect that I wanted was there, but the result was lacking something. Toni loves this one for the abstract quality, and she had the honor of naming it as well. I'm still not sold on the image, but I can see potential in it through Toni's eyes. While still in the early hours of the morning, I worked on some more compositions as I dialed in my vision for the shot. For me previsualization is so very important for photography. I have to have an idea of the final piece before I can set up the shot. I worked in closer and closer until I had a view that I was pretty sure was what I was after. It was another intimate shot, but composed completely different. The resulting image captured what I had in mind from the powerful face of this International tractor to the detail in the wood of the shelter. The headlight, much like an eye of a person stood out in a generally even toned image. Yeah, I liked this one, liked it a bunch! When I got home, however, I found out that while it captured what I was seeing in my mind, what I didn't realize was it was missing the emotion I was going for. While editing it, I decided to give it a try as a monochrome image. When I did, and started playing with the tonal values, I found an image that all of a sudden popped off of the page at me. THIS WAS IT! 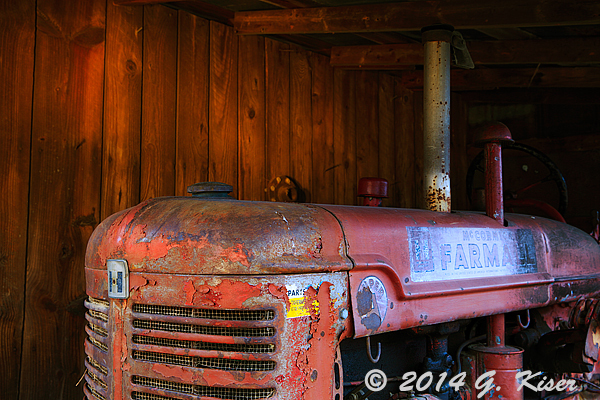 This had the feel, and more importantly, the emotion that I was going for with this tractor. 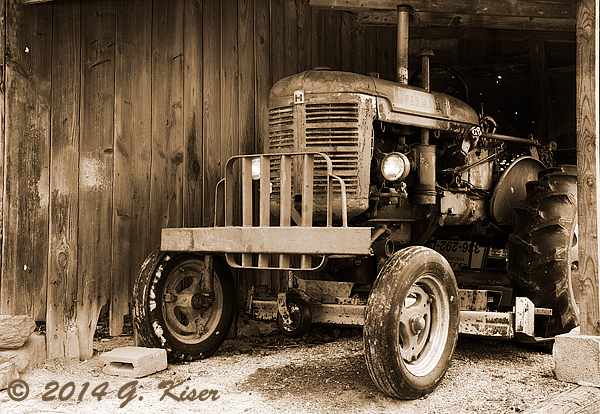 I had that gritty image that really stood out, and captured the enduring power of this old tractor. Oh, did I mention, it is still in use to this day! The patina of the finish would suggest otherwise which is probably why I am so drawn to this tractor. It looks long since forgotten, but still has a sense of pride about it. With the sun coming up, and things getting a bit brighter, I decided that I would try some other compositions of the tractor just to see what worked and what didn't. I stepped back a good bit, and framed a tight shot that I wasn't quite sure I would be able to pull off. Surprisingly, with some careful positioning, I was able to not only eliminate the outside, and the roof line, I was able to give the illusion of this being completely enclosed in a barn with me standing beside of it. I was liking this view quite a bit. I snapped a shot with the available lighting and was happy with the resulting capture. I was happy with it, but it didn't sing like I was picturing it in my head. Something was missing. It lacked warmth, and it lacked some visual weight on the wood behind. Well, I was still shooting in the range of 10-15 seconds so there was still time to add a bit of light with a flashlight. I wanted more warmth, and more "mood lighting". When I saw the resulting image with the additional lighting, I knew that was the trick. It had the mood that I was after, and more of a visual balance between lights and darks. I was even happier with this, and it actually turned out to be one of my favorite images of the day. But just because I was that happy with the image didn't mean that I was done with it. I could see other potential to this composition as well. To add to the old feel of it, with the very similar overall tone, I was seeing this as a sepia rendering. I don't often use sepia in my prints, but I thought I would give it a try anyway. I have to say, I actually like the sepia just as much as the full color image, which is odd for me. 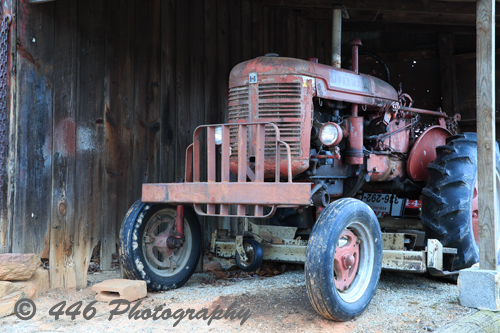 There was just one more view that I really wanted to get on this old tractor before I left. I wanted the detail of the nose and hood. That patina was just calling out my name. I got in close again and framed up the shot that I was looking for. I was able to get the hood emblem as well as the tractor label in all of its aged glory in one shot. As with the previous shots of the morning, the wood needed a little painting with my flashlight to really capture the detail. With a limited depth of field, the wood was slightly out of focus, but the grain could still be made out while keeping the sharp focus right where I wanted it. I was having a great time with this tractor, and there were some other things that I wanted to try around the property. However, I could no longer feel my fingers, and the gloves were not helping at all. I had lost the ability to move the zoom ring on my lens, and could just barely work the focus ring. It was time to pack up and go. The only problem with that was, I couldn't put the lens cap back on. I dropped it three times before taking my gloves off (I had two fingers exposed) and by using one hand to hold the cap in place and the other hand with three fingers to squeeze the clips, I was able to put the cap on despite having no fine motor skills left. I was done...and my hands were worthless now. On the way home, I had the heat blowing on my fingers and they felt like a vise was squeezing them. I was not a happy camper, not at all....but I had gotten what I figured was at least one good image from the morning out of about 16 exposures. Little did I know that I had quite a bit more than one keeper out of these. I'm quite happy with the morning, and am very happy to be back home with Toni and the heat! This was a very productive trek that wasn't even designed as a trek. Every year Toni and I celebrate our anniversary by going to the mountains and staying in a cabin just like we did for our honeymoon in 2011. This was our third anniversary, and now the second time that we stayed at this cozy little cabin just outside of West Jefferson, NC. An interesting factoid, in the years that we have been married, I was only an active photographer for the first year. I did a little photography on our honeymoon, but for the anniversaries that followed, I wasn't interested in photography in the least. Fast forward to this year....with my photography entering back into our lives, Toni suggested that I bring along the camera for this trip. While that wasn't going to be my main focus, I could hardly disagree with the logic. It was going to be like old times again! I figured that we would get out and do a little bit with the camera, but I wasn't really expecting much in the way of trekking on this trip. Plus, I was a lens down since my 70-200mm telephoto was still at Canon being worked on. It actually was being shipped back while we were gone, and arrived at the house a couple of days before our return. Without that lens, I was restricted to only two lenses, which fortunately were my two most used lenses for landscape work. I took everything and figured if I could get a picture or two I would see that as gravy on what was sure to be a most enjoyable trip with Toni. The weather forecast was all over the place for our stay there. We were looking at clear days, cloudy days, cold days, REALLY cold days, and some snow days to boot. This should be exciting! We arrived at our secluded cabin right on time on Saturday the 18th. We got in and got settled in for the afternoon and evening. 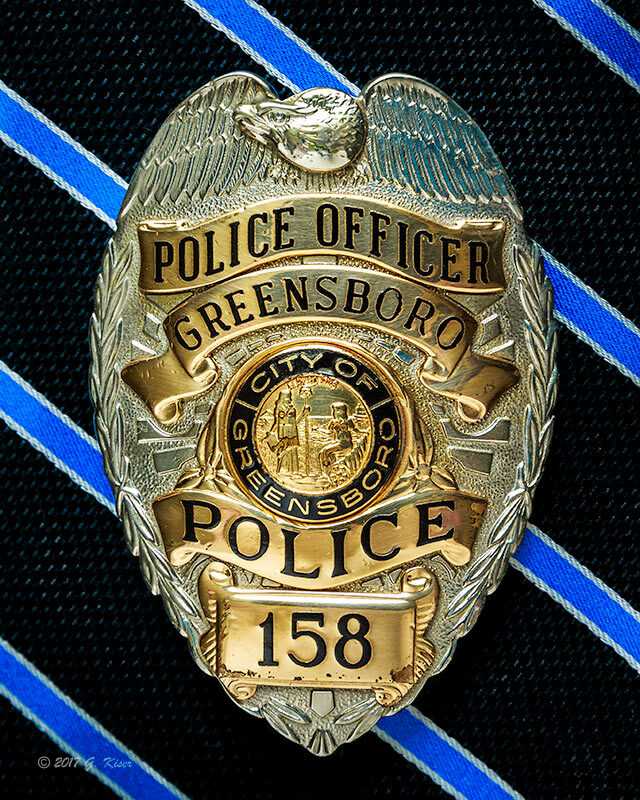 I wasn't really thinking much about photography, but had noticed that there was snow on the ground, and being located in Winston Salem, I knew that snow pictures were few and far between for me normally. I figured that my best bet would be to get up early in the morning and do some exploring on foot around the neighborhood which was far from developed. The alarm rang very early, and I just wasn't quite ready to get up. The dark sky looked totally overcast which was going to kill my only idea for a photograph (a shot looking up at the cabin from the road below). I decided to roll over and go back to sleep. That was an easy decision since Toni wasn't interested in going out in the snow with me that early in the morning. Try as I might, I was not able to get back to sleep, so I went ahead and got up to go explore a little bit. I was having a hard time finding anything that really excited me photographically. My idea for the cabin shot wasn't going to work as I had intended. I was left with no clear idea of what to work on. I just walked aimlessly up the road and looked at the different vacant lots. In one of them, along the driveway, I found a nice little rock sticking out from the snow. There was a fairly fresh red leaf right next to it as well. The driveway had a nice leading line, and I could see the sky which had some clouds in it. This was starting to develop into a composition. I quickly got the camera set up with my 24-70mm lens. I added a color intensifying polarizer as well as a 2-Stop soft edge ND-Grad filter to control the sky. I'm not sure why, but the white balance in the camera was having a hard time resolving the light. It was showing a very blue color cast in the LCD. Figuring that it was just cold, I snapped away, knowing what I was seeing in front of me, and knowing that since I shoot RAW I could adjust the white balance later to more accurately show what I was seeing. It wasn't until I got home and started to fine tune the white balance that I was able to see the image as I remembered it. The color intensifying polarizer did exactly what I wanted it to do. The sky now popped with warm tones against a blue background. Thanks to the graduated ND filter, the snow was still properly exposed, and what I had captured was actually the tail end of a colorful sunrise which was ever so faint in the sky at the time of capture. I continued to walk around for a bit and found a handful of other subjects to capture. They were not all that exciting though, and ultimately they got cut and left in the recycle bin on the computer. I was having a hard time getting inspired. After about an hour, I headed back to the cabin. Before I went inside though, I walked around to see what views I had from the deck. While they were not my customary views, I did see some moderate potential, and for the moment, the sky was looking pretty good. I managed to pick out a relatively tall tree to use as an anchor and counter balance to a distant mountain and open range on another hill. I was able to set up the shot without switching lenses. The lighting was pretty good and did not require the ND-Grad, only the color intensifying polarizer. It took a few frames to find a composition I could live with, but I think the vertical orientation suits this scene quite well. I was very lucky that the trees still had some red leaves which added a nice warm touch to an otherwise cool image. Because of those tones, I was able to have a well balanced image. With those images taken, it was time to get back in the cabin and warm up. I had shot quite a bit of "film" for my short walk. I knew that most of it would be throw away images, but I was pretty happy that I was able to get out and give it a try. I figured that was going to be it for the day, and was ready to settle down to enjoy some relaxation time with Toni. While we ate breakfast she suggested that we go out for a little while and see what was around us. Her main reason was a little more utilitarian than that though...she had run out of Chap Stick and needed to get some more (it was an emergency!). She pushed me to take my camera gear and I reluctantly agreed with her. I figured we might run into something interesting, and I would hate to miss out on a good picture. After we replenished her Chap Stick supply, we started out on a Sunday drive with an unknown destination. We drove for miles and miles it seemed. The lighting was not all that great, but I was enjoying the mountain scenery as was Toni. I was dead set on finding some old barns or old cars to photograph, but she was wanting some more landscapes since I haven't been doing many of those lately. I was looking for those as well, but tend to enjoy them more after Spring hits. However, I have learned to trust that little voice that sits to the side of me in the truck, and she was feeling landscapes today. As we were driving down a winding road she spotted a rock and pointed it out to me. I was in the middle of a tight curve and couldn't see it, but figured that she might have something. I knew I wasn't coming up with anything interesting! I turned around, and found the rock. I could see some potential in it, but wasn't convinced. I got out of the truck anyway and walked over to it. The wind was howling....the gusts were about 20-30mph, and with the wind chill it was feeling like single digits. Oh well, we were out here now, and Toni wanted landscapes. After getting the camera set up, and before my fingers went completely numb, the clouds started to do some very interesting things. I quickly set up several different compositions that showcased the rock that had caught her eye. What I was seeing was some very deep blue in the sky with some expansive clouds full of texture. This was going to work out! I still had my color intensifying polarizer attached, and was not able to add any other filters because quite frankly, my fingers were not working very well at all. Fortunately, the exposure was well within the latitude of the camera and I was able to capture some nice tonal ranges. In fact, there was so much tonality in some of the images that I was able to render my favorite in black and white as well as color! The wind was still howling, and I could not feel my arms, hands, or feet at this point. However, I wasn't convinced that I had captured everything that there was to capture. I was very happy that I had listened to Toni and stopped at this rock. I was starting to feel its potential as the sky moved around it, and I was able to work on different shooting positions. 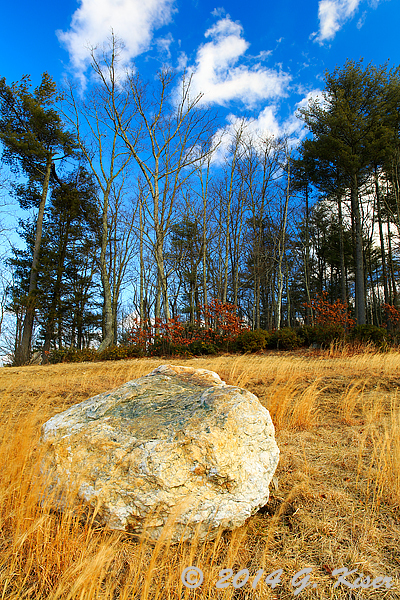 I found another angle that gave the rock some nice front light with some very tall trees in the background. The sky was still primarily blue in that direction with some puffy clouds. It was worth a few exposures I figured. As I was setting up, the sun came out and bathed the foreground in a nice warm tone (thanks to the Singh Ray polarizer). I quickly finalized the shot and released the shutter. I got the moment that I was after, and it was a fleeting moment to be sure! After that composition, I decided to call it quits. I pretty much numb from head to toe at that point, and was having a very hard time manipulating the camera. I loaded everything back up and Toni and I started back towards town. she was hungry so we stopped for lunch in Jefferson. While we were eating, she suggested that we continue down the road that the McDonald's was on in search of more to photograph. She is so cool, and so supportive! We set out for an unknown destination. I could see a lot of barns along the road, but none of them yelled out to me with the current lighting. Then I caught something out of the corner of my eye. Could it be? Was it what I thought it was? Is it even possible? 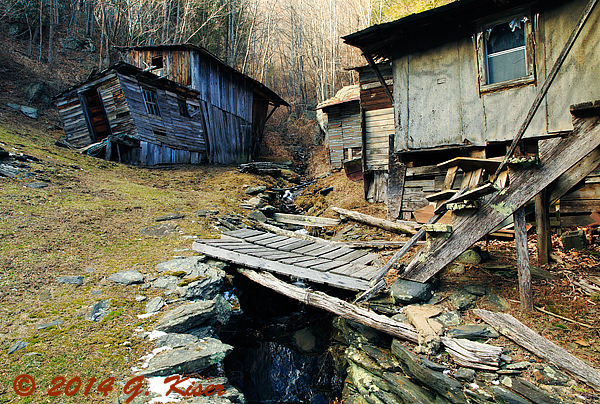 Yes....it was a group of old buildings along the side of the road complete with barns, homes, and a small stream! It was cluttered, and bunched together, but the cool factor of it being on the side of a mountain was too hard to pass up. Toni even gave it a 60% thumbs up. I pulled into a church which was beside the driveway leading into the "compound". Looking at the property, I couldn't imagine that anyone lived there, but just in case I didn't want to infringe on anyone's privacy so I stayed at the entrance to the driveway. I set the camera up and started to make some images using only a polarizer with my 24-70mm lens. After about 3 frames, I saw a man come out of the white house making his way toward me. Hmm, I guess somebody does live there. 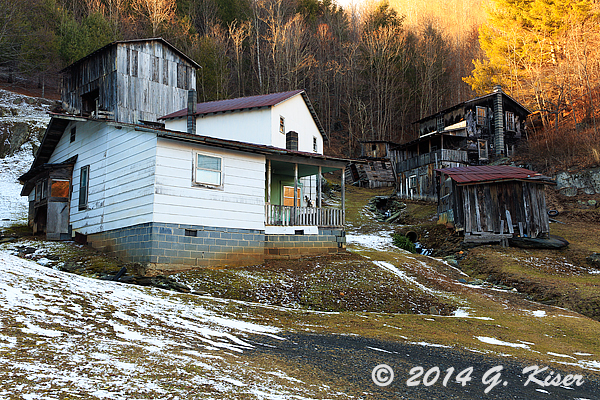 We introduced each other, and he gave me full permission to photograph around his property. He told me that he had lived there all his life (he was born in 1942), and this was the family tobacco farm years ago. He told me about who lived in the house which is up on the hill to the right, and told me about the old barn that was caving in at the top of the hill. He even told me about the stream that floods every spring when the snow from the mountain melts. It was a very informative conversation to say the least, but most importantly, I had free reign to photograph on the property! 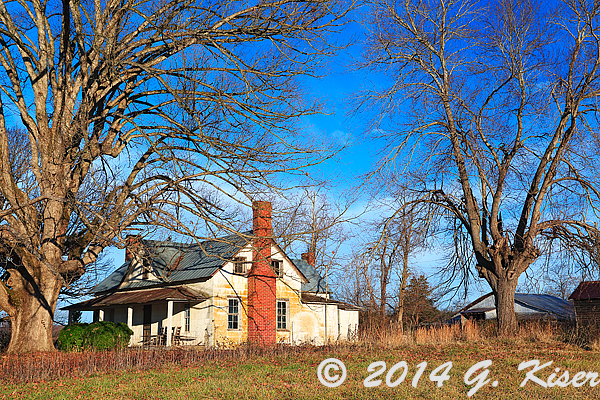 From the road, one of the most interesting parts of this property was the large house up on the hill. You can see from the angle of the foundation just what kind of slope this farm was on. I just couldn't get over it! 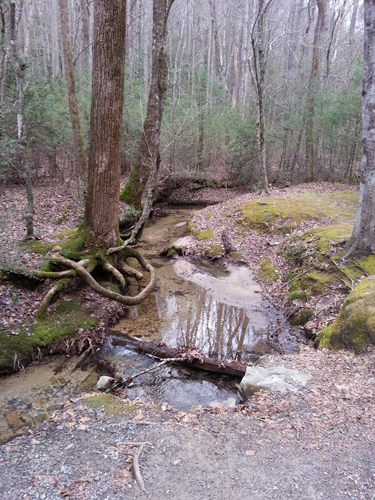 The stream was pretty much dry today, but there was a little trickle of water running down the mountain. As an added photographic bonus, there were some very small waterfalls along its path. I worked every composition that I could muster with the confined space I could work in. I found it it very difficult to make simple compositions of the buildings, but was able to find some very creative ways of isolating the interesting elements that I was after. 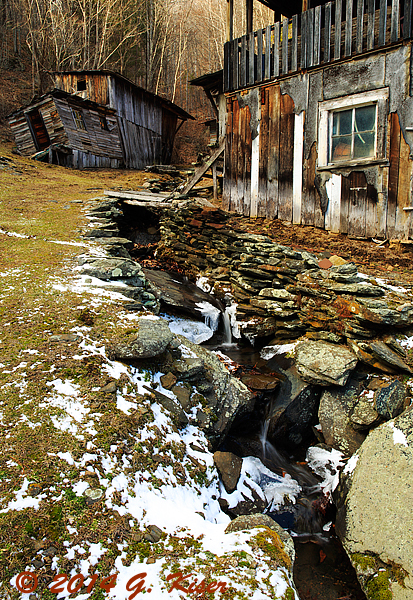 I really liked the stream that went through the property, and I tried several different compositions to make it work. This was one that I wasn't really convinced I would like, but it turned out quite good when I saw it on the computer. The stream is the most important part of this shot, but the window is the visual anchor. The eye candy is the barn in the distance. Everything really worked out well here, and the title brings it all together I think. I tell you what, I was in hog heaven on this hill. Even though I was having a hard time keeping my footing, and compositions were a creative exercise...I was having a blast here! As I was working on the compositions involving the stream, it became very apparent to me how this very definitively cut the property into two halves. Toward the back end of the property it was almost a division of home and work with the houses on the right, and the barn on the left. The only safe crossing was courtesy of the bridge that had been built across the stream. Of course, the title was a natural with the division in the land, and the current state of the structures. 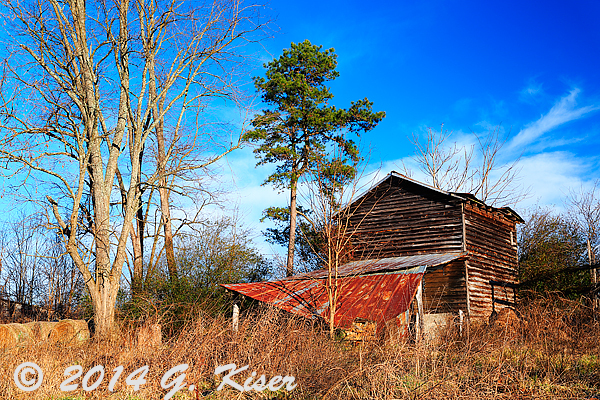 Probably my favorite structure on the property was the old barn at the top of the property. There were lots of little details about this one that made it stand out. Most obviously, it was falling in on itself, while one side was still very much in tact. If you look closely, there is a pile of timber there that appears to have been left to help shore up the weak side some time ago. I guess that project wasn't started in time, and the side fell in. Another little detail that caught my eye was a rock that was in close proximity to the the building. There was even a little plant growing out of a crack in the rock that gave a nice pop of green in front of the image that I was composing. It wasn't until after I was done editing the picture that I really figured out why I liked this shot so much. It was all about time. The rock is a constant through time, while the plant is fleeting. 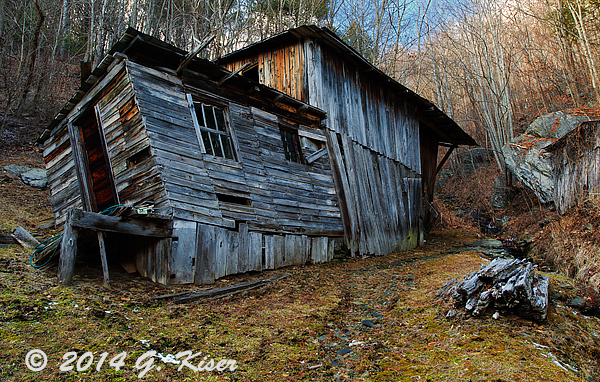 The barn was built with longevity in mind, but age has taken its toll on the old wooden structure. Yes, the barn was there long before the plant, but the rock existed before either, and will most likely remain long after the barn and plant have changed. After what I think was about an hour and a half, I made my way back down the mountain and thanked the owner one last time before packing the camera up and loading it back in the truck. It was time to head home as the light was quickly fading away. I was tickled to say the least at what I had captured the day before. I would have been happy if I didn't pull the camera out another time while we were in the cabin. Monday, we had plans to go into Boone and do some shopping. Toni suggested that I bring the camera. I figured that it wouldn't hurt to do just that...just in case. We made the short trip into Boone, and ultimately Blowing Rock to get some shopping done. We had a great time, and we finished a couple of hours before sunset. That was enough time to work on some pictures before dinner time. 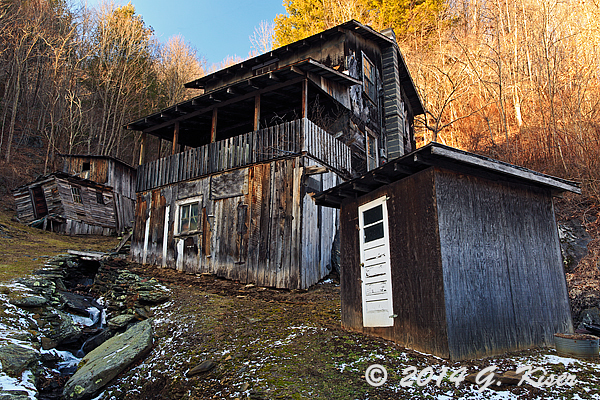 I had seen a barn on the way up that I had wanted to photograph before, but had never given it a try. The problem with this barn is that there are all sorts of buildings all around it that really make for a difficult composition unless you want to include stores, commercial buildings, or a brick house in the frame. However, I figured I had nothing to lose by giving it a try. I scoped it out quickly and decided that I could work a composition that included the trees in order to block some of the surrounding clutter. I found out rather quickly that using the trees was a good idea and it helped me isolate the barn. My main problem now was there was absolutely no character to the sky. It was just a blah blue, but I was here, and I meant to photograph this barn. Fortunately, the trees helped to give me a little texture to the sky which really helped my compositions. In fact, the trees had a lot of character on their own. 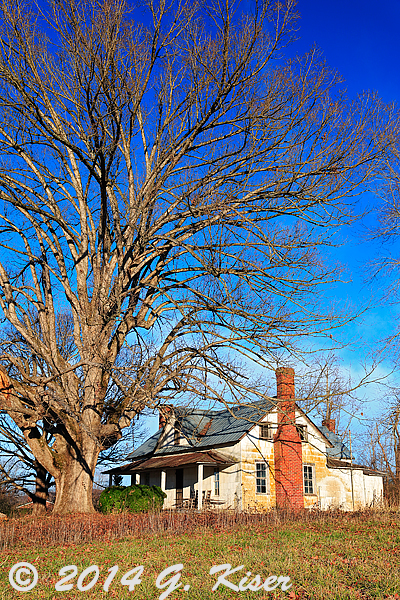 While I was fighting with the barn, Toni directed my attention to a tree beside the vacant house behind me. The sun was hitting it just right, and it was creating a nice warm silhouette against the blue sky. I pointed my camera that way, and worked on several compositions. What I found was a nice and intimate shot of the tree seemed to work out the best. A full on view was nice too, but there was no denying the impact of the close in shot. Toni and I just loved the warm tones against the cool blue sky. Bare trees are a natural at this time of day!!! After I was satisfied that I had the tree, I directed my attention back to the barn. 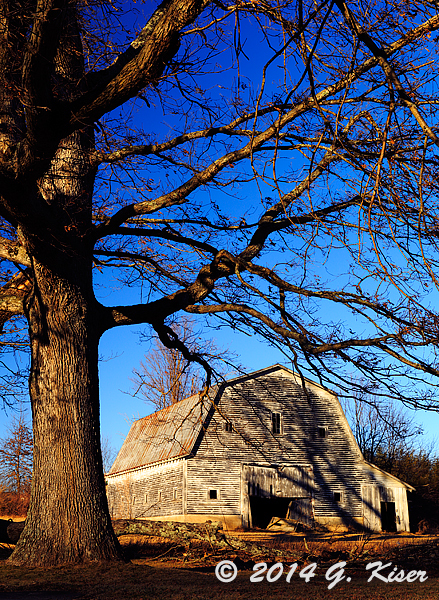 Thanks to my compositional choices with the bare tree, I was now looking at the barn in a vertical perspective. Huh....this might just work. I was now showcasing another tree, but not as a primary element this time. 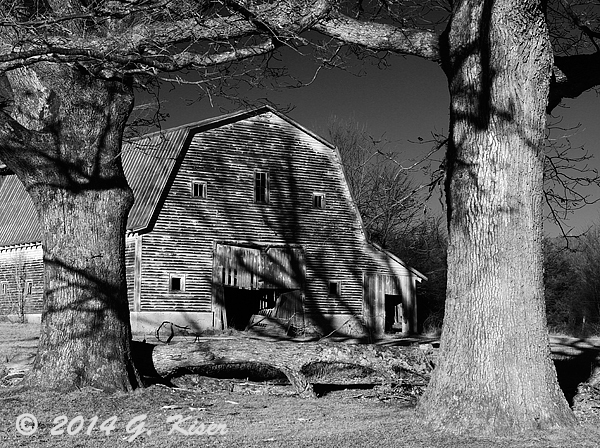 It was a secondary foreground element for the barn that I was really wanting to be the focus of the image. 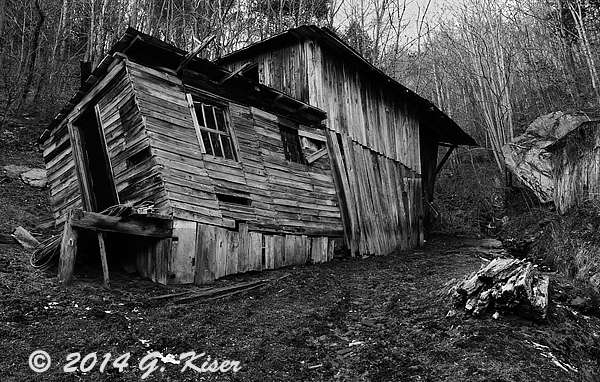 All of a sudden it all came together, even the shadows that seemed to be creeping up from the ground trying to envelope the old barn. This was the shot that I wanted from this barn, and I don't know why I didn't see the portrait orientation before, but I'm glad that I had the vision for it now! When the barn was done, it was time to head back to West Jefferson to get some dinner and get back to the cabin for some more relaxing. I might have just photographed one location today, but I was pretty sure I had a few good images from my short time there. Toni and I awoke to what we were expecting to be a snowy day. Instead, there was no signs of snow at all. Oh well, we were planning on staying around the cabin anyway after a couple of days of driving around. We had a lazy breakfast and watched some television as it was starting to flurry outside. Before long, the snow was starting to stick and the sky was starting to do interesting things. Still wanting to photograph the cabin we were in, I felt that this was my chance. After we had about 2-3 inches on the ground, I grabbed my gear and went out in the driveway. Because it was still snowing, I had to act quick since I was using a 2-stop soft edge ND-Grad filter to keep the sky at bay and show the delicate colors I was seeing. Every second I had the camera set up, I was getting more snow falling on the filter. I had to make a concentrated effort to keep it shielded, and to keep any snow wiped off. I wasn't out there but about 5 minutes. I tried several different compositions, but I settled on this one. What I love about it is the overall cool color tones thanks to the blue sky, and white snow covering about everything. There are two distinct pops of warm tones that balance everything out. The cabin obviously, and the small tree with the leaves still attached bring a nice complementing element to the composition. The framing is loose enough to allow the trees room to "grow" and breathe which gives this image a very airy feeling. I'm really happy that I was able to get this image and continue with my tradition started on my honeymoon of photographing the cabin. Now that I had the image I thought would work, I quickly headed back to the warmth of the cabin to let the camera dry off, and to clean up the filter. While I was thawing out, I could see that the sky was doing some really cool things on the other side of the cabin. It was still snowing, but I figured that I owed it to myself to run outside real quick and give it a try. I kept the camera set up like I had it, but swapped the soft edge filter for a hard edge ND-Grad. I tried several different locations before I settled on this composition. I think that it really describes how the weather is in the Appalachian Mountains....We went from a nice clear blue sky, to some fluffy clouds, followed by some dark gray snow clouds, all in a very short amount of time. That is part of the fun, and frustration about living out here. The weather is constantly changing, but that is part of personality of the region, and Toni and I embrace it! That pretty much sums up the photographic end of my anniversary trip. Toni and I had a great time, and we can't wait to get back there soon! Thanks for reading all the gritty details of how my images came to be this week, and I hope that you enjoyed them! 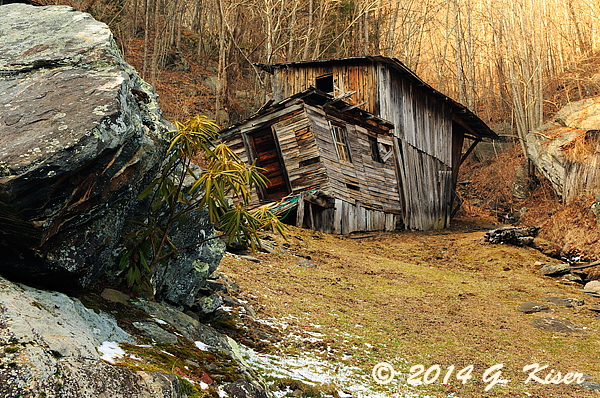 Winter is an interesting time for a photographer in the Southeast United States. 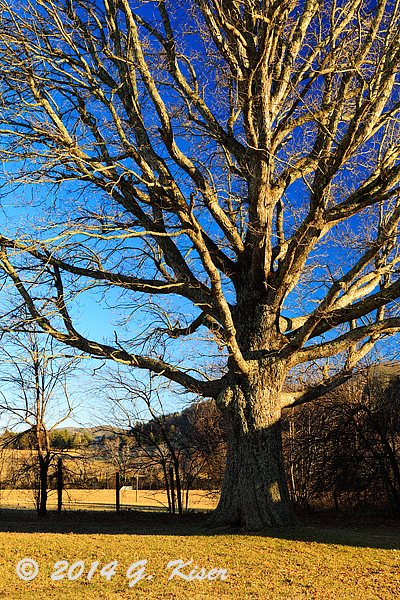 While much of the country experiences snow and other "typical" winter conditions, North Carolina usually is graced with bare trees, and dormant vegetation for much of the season. When I started out as a photographer, I would struggle to find suitable subjects to photograph in the winter months. I deemed the colors too drab, and the the lack of vegetation to be rather dreary. While I still subscribe to the notion that the other three seasons are much more photogenic for the most part, I have learned a certain appreciation for winter in North Carolina. Ironically, I decided to dive back into photography after a nearly three year hiatus right at the end of Fall. While many photographers are taking a break from their cameras until Spring, I was gearing up to reacquaint myself with a Canon DSLR, and looking forward to the coming months. 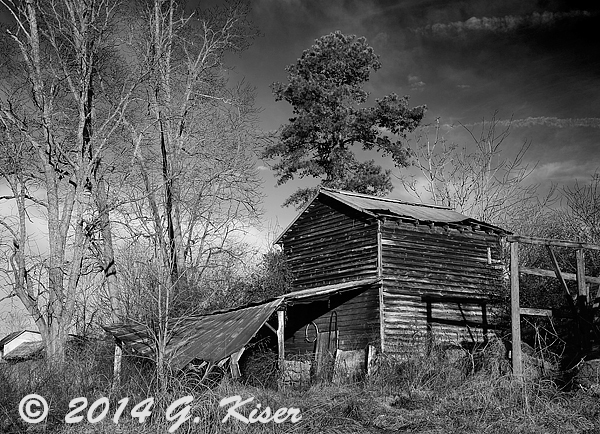 I quickly got back in the swing of things photographing barns and old homesteads. I even fanned the embers of a new genre which I had just started toying with...abandoned, vintage automobiles. It seemed that there were plenty of subjects for my camera to capture, but when it all boils down, I am a landscape photographer after all. I cut my teeth capturing scenic mountain vistas starting as early as 2004 when I was learning on a 2MP Sony digital which saved files to a 3.5" floppy disk! I've shot a few landscapes since unwrapping the new Canon kit in November, but I want to do more. The trick to landscapes is the weather, which means that I have to wait for the right time to go out. With the right weather, I have to choose a location that will fit with the specific weather patterns which are expected. I have been watching the weather closely over the last few days and decided that today would be a decent day with partly cloudy skies to begin with, followed by mostly cloudy skies toward the end of the day. There were also no heavy winds forecasted for the day. The weather was right, and seemed to be rather varied which would allow me the opportunity to shoot several different types of landscapes in one day. Based on what I was seeing on the weather, I could do some grand landscape work incorporating the sky to start the day off, and move into more intimate landscapes to wrap the day up once the sun was obscured. 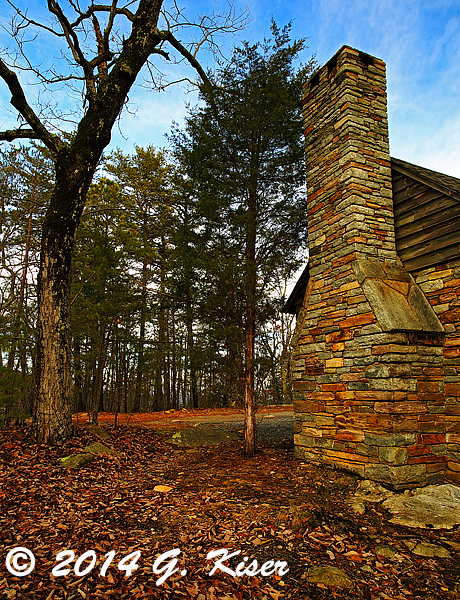 I woke up with plenty of time to get ready and make the drive to Stone Mountain State Park, located in Roaring Gap, NC. This is one of my favorite locations for the diversity of its contents. I have some vast views from the upper elevations, as well as some interesting details in the lower elevations. 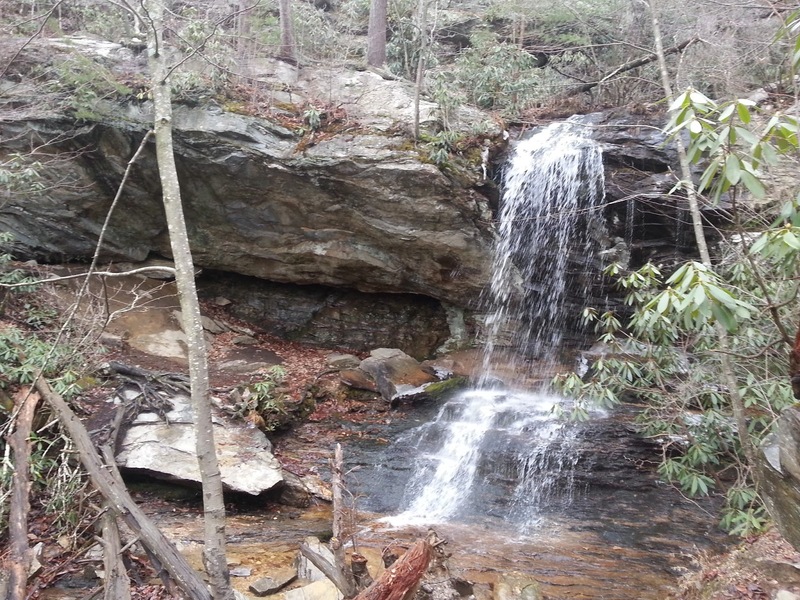 There are also waterfalls, streams, and an abundant population of wildlife. My plan, after looking at the weather once again was to hike the Stone Mountain Loop trail which is a little over 4.5 miles long. I would climb to the summit first to take advantage of the (hopefully) dramatic clouds before dropping down to the lower sections near the waterfalls to take advantage of the heavy overcast of the afternoon. It was one stop shopping, and I was looking forward to what I might find. I arrived at the park shortly after it opened under mostly sunny skies. The weather forecast wasn't exactly accurate up to this point as I was expecting some more clouds. Oh well, I was here, might as well get to steppin' and hope for some clouds by the time I got to the top of the summit. I started following the trail and quickly found myself going up.....up....and up. For about a mile and a half, I was climbing until I reached the first exposed section of granite nearby the actual summit. I was ready for a break as I could barely breathe from doing all that climbing at a fairly quick rate. I noticed that the clouds were starting to come in, and the sky was pretty interesting. I needed to work out a picture, but none of the grand landscape options seemed to look promising with the existing light. I remembered reading in a book years ago, "always look behind you when you are looking at the obvious composition." I've always taken that mantra to heart, and it has payed off more times than I can count. I turned around and started looking further up the mountain instead of down and out over the valley. What I found was a few interesting elements scattered along the granite, but more importantly, the sky was infinitely better from this angle! I looked at many of the bit and pieces of foreground interest that were available to work with, but I found that none of them had the visual pop, quite like a little sapling that was growing out of a small patch of soil. The problem was, it was rather small and insignificant in the whole scene. That's ok, because I have a little trick up my sleeve that will change the proportions of objects in a photograph. Its call lens choice! The focal length on a lens doesn't just mean that you can fit more or less things in the frame. Focal length is actually much better utilized to change the relationships between objects in the frame. In this situation, I wanted to give the small sapling a good deal more visual weight in the image, while minimizing the background. The way to do that was to use a very wide focal length and get up close to the sapling. I snapped this picture with my cell phone to show what I am talking about when it comes to perspective. The cell phone shot is a typical point and click while standing up. The little sapling actually gets lost in the overall composition, even though the yellow tones should make it stand out on its own. By choosing my 16-35mm f/2.8L lens and capturing this view at about 20mm, I was able to really accentuate the importance of the sapling in the overall composition. I'm sure that you will also notice that the sky is completely washed out in the cell phone image. There was just too much exposure latitude to deal with. Fortunately, I also had a couple of tricks to help with that as well. First of all, I fitted a color enhancing polarizer to help bring out the color, and then I added a 2-Stop hard edge ND Grad filter to hold back the exposure in the sky. This gave me a nice and consolidated histogram to work with so I was sure to get a complete range of tonalities in the final image. All that was left was to wait for the sun to pop out from behind the clouds and provide a little pop to the sapling. When I was done with the little sapling, I packed things up and went back to the trail. I continued on until I made it to the actual summit of Stone Mountain. Again, I was having a hard time finding a suitable composition that would work with the existing lighting. There was also a lack of visual interest due to the bare trees below. In the fall there are lots of workable compositions from here with the bright colored leaves, but today, there was very little to be found. I decided to repeat my trick from earlier to see if I could find another hidden composition atop the summit. Nope....wasn't that easy. I started to walk around...well down the slope actually. I was careful not to get in any steep sections that would be dangerous to work from, but I did make it about 75 feet from the trail before I found a single tree growing from a crack in the granite. Not only was this a really cool tree, it happened to be next to a nice eroded section that added to a visual line leading into the image. Beyond the tree was a nice set of diagonal lines which lead up to the sky above. Yeah, this will work out nicely! I had to get a little creative here though. I was shooting from well below the tree due to the slope of the summit. If I kept my camera at a typical elevation, the slope would appear flat and rather static. 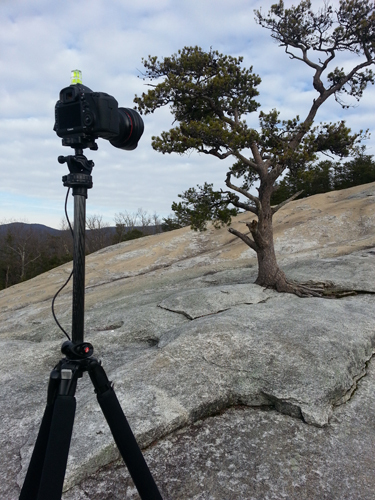 Fortunately, I had selected a tripod that would extend much taller than I was, and I used that feature to elevate the camera as high as I could get it. Another issue that I was facing was the clouds. They were starting to thicken up and I was worried that I would lose visual interest in the sky. To help combat that, and add a little contrast to the sky, I kept my color intensifying polarizer on the superwide angle lens. I ditched the ND Grad since the actual exposure was working out well here without it. Plus, I needed to keep the detail in the tree. All that was left was to wait for the sun to peak out a little bit and shine some light on the tree. While I never got the full power of the sun on the tree, there were times when the clouds were thin enough that I had sufficient illumination to make the composition work. As you can tell, lens choice, and filters really helped based on my lighting here. You also can get an idea of how high up the camera is. Without the center tube extended, the camera sits at eye level to me, and I'm 5'11". Had it not been for the extended center tube, the slope of the landscape would have been lost in this image. Honestly, that was an important aspect of this composition, and one that I really wanted to keep. Interestingly enough, with all the work that I did to make sure that the colors came through as vibrant as I was seeing them, I still thought that this would be a good candidate for a monochrome conversion. With the addition of a digital red filter and a few minor tonal tweaks I ended up with a black and white version that I think works very well in its own right. 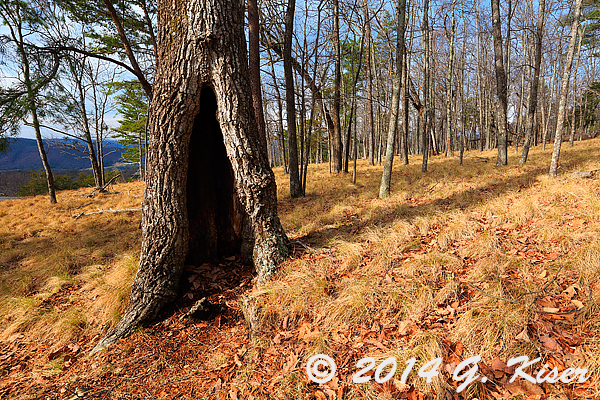 As I was leaving the summit to return to the trail, I found a an old tree that was hollow inside. Ever since I was a kid, I have been intrigued by these rotting trees. They tend to take on a personality, and even appear as though they could come to life. I'm pretty sure that they can't, but as a kid you couldn't tell me any different. What I loved about this tree that I had just found was that it stood by itself at the edge of the trail with the rest of the wooded area well to the rear. Its rare to find "uncluttered" woods in North Carolina, so when it happens, I feel very fortunate. That was the case with these woods, as they were fairly well organized, and lacked the typical ground clutter I am more accustomed to. I decided it was time to pull the camera back out and get it set up. 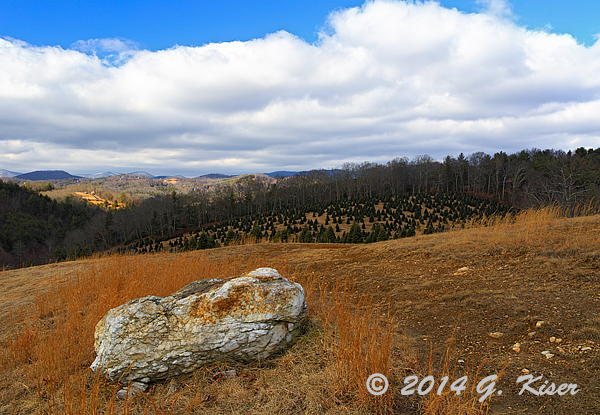 In a creative choice, I decided to leave the wide angle lens on with the intensifying polarizer as well. I started with a vertical shot to accentuate the height and power of the tree. I didn't like anything about that composition, so I flipped the camera back into landscape mode. There it was! I was getting the wide open mouth with the other trees in the background. I happened to notice a shadow that was cast when the sun hit the tree. If I were to move a little to the right, I would be able to capture the shadow as it created a diagonal path through the frame, providing a ruler of sorts for the other trees to line up on. As with so many of my other compositions for the day, I had to wait for the sun to add its special touch in order for the image to really come together. There were a few breaks in the clouds and I was able to take advantage of most of them to get the right illumination on the scene. And you thought photography was a simple thing! Since the exposure wasn't all that difficult here, once I was happy that I had enough lighting choices to select from, I packed up and continued back on the trail. At this point, I was starting to descend below the summit. It was nice to be able to let gravity help me walk as opposed to all the climbing that I had been doing. I thought that I was done with my grand landscapes and I started to look for more intimate subjects which worked out just fine since the clouds were steadily moving in. 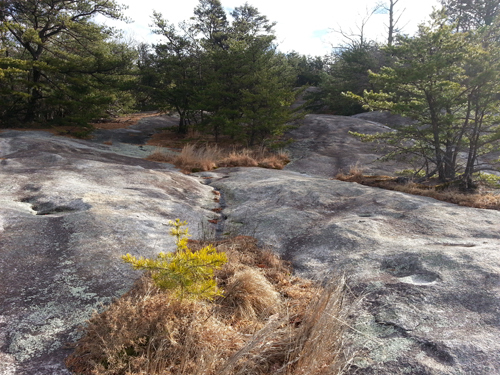 However, I reached another granite bald just off of the trail that I went out on and checked out. 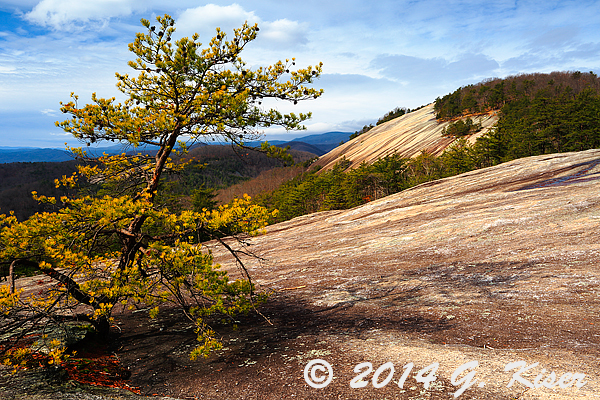 This one was a bit different than the others because it actually offered a view of Stone Mountain. This was worth a shot or two for sure! I quickly found a nice tree to use for foreground interest and set up my first series of shots with the tree to the right of the granite bald. Surprisingly, the sky had opened up right over and there was a nice rich blue above the dome. I composed, and set my exposure using my wide angle lens with the color intensifying polarizer still fitted. It was then just a matter or waiting on the sun to give the tree a little added pop to complete the composition. After working this scene for a little while, I decided that I might like the composition better using the tree on the left hand side, rather than the right. I moved the rig over to the right and recomposed. I had to be careful though because my shadow was starting to become an issue at this angle. After setting the shot up, I realized that I did like this view as well. It had a completely different feel to it, and seemed to work just as well. The main issue was the clouds were moving over me, and I was having a hard time keeping the exposure in the sky from blowing out. I decided to fit a 2-Stop soft edge ND-Grad in addition to the polarizer. that did the trick! My exposure latitude was once again within a normal parameter. It was still a waiting game for the sun to cooperate with me. 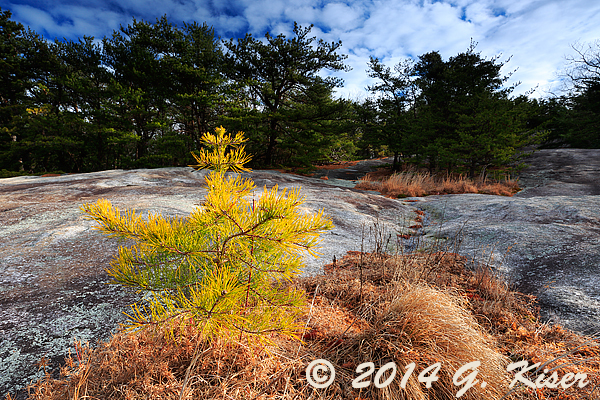 I would fire off an exposure every time the clouds thinned in hopes that I would get a little color added to the tree. I was lucky that I was able to squeeze a little bit of light for this composition. I think the added pop of yellow and light green are very important to this image. An interesting aside about this particular image, while reviewing the last two frames (this is one of them) on my LCD, I could hear some movement in the woods behind me. I could hear the leaves rustling, and what sounded like heavy breathing. I thought that it was a deer at first. I started to look around in hopes of seeing it. What I ended up seeing as a man with his dog walking along the trail above. He waved, and I said hi as I remained sitting on the rather steep incline working my camera. I then realized that the dog was not on a leash, and was breaking away from his owner. He was making a direct line to my camera bag, which was open, about 15 feet from me. I wasn't able to get up quick enough to intercept him. The only thing I could do was say "no, stop that! ", which fortunately worked. After a quick sniff, he lost interest in the bag. However, I think my request was lost in translation since apparently he thought I said "hey, come over here and play with me!" He started trotting over to me, and I had no time to react. I was still sitting down on the slope, and fortunately I was still holding my camera. The dog went right for the tripod and bounced his nose across the LCD (apparently, he liked this one too). Had I not been holding onto the camera it would have gone over without a doubt! I was now struggling to push the dog away with my shoulder, while holding onto my camera for dear life, knowing that if I were to lose my grip on it, and it fell, it would likely slide down the side of the mountain never to be found by me. All the while this was going on the dog's owner was slowly walking my way saying very slowly "I'm sorry, we didn't expect to see anyone else out here." Well, that's just dandy, I didn't expect to play with a dog either, so I guess both our intentions for the day were altered. He asked if I was alright while I'm still trying to keep the camera upright, and the dog off of it. My reply was something along the lines of "I'm fine, do you think that you could maybe take control of your dog so he doesn't knock over this camera?" He slowly got a hold of the dog, and then proceeded to stand there with the dog still trying to get to the camera. I had to use my adult voice and give some very clear instructions at this point because I was not in the mood to have a $5000 catastrophe today. With the canine adventure finally concluded, I was able to get back to business. Unfortunately, the light was gone at this point, and my mood was less than creative. I decided to pack up my equipment and be very thankful that there was no damage. 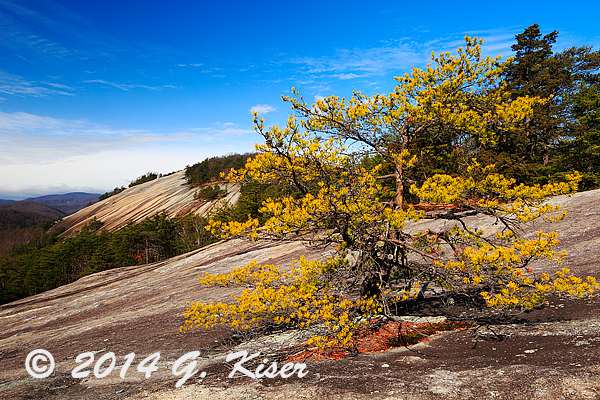 I made my way back to the trail and worked my way back down the mountain to the lowlands of Stone Mountain. The clouds were coming in, and I knew that I had some waterfalls, and some nice streams that I could work. For some reason that didn't really excite me like I had planned. I mean, the whole purpose of coming out and doing this particular trail was because I could make use of the clouds during the second half of the day by shooting moving water. Regardless, I wasn't feeling much like doing waterfall photography today. I did continue on though because I was over half way done with the trail at this point. I followed the stream for a good while and found some areas that I had shot years ago, but there were too many low limbs this time to get any good compositions. I did find one area where I have not photographed before which looked promising. 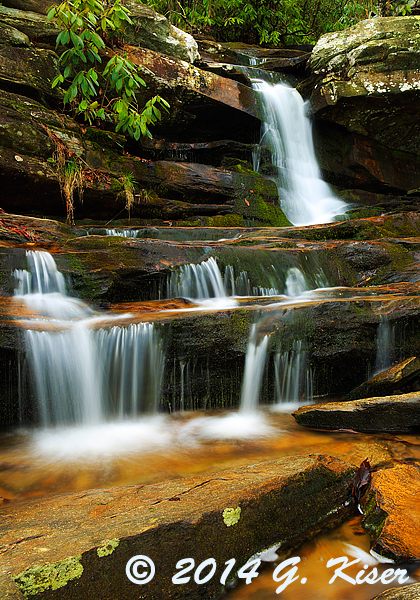 They were small cascades, so I decided to swap in my 24-70mm f/2.8L lens so I could get in close to the cascades. Even with the clouds, I was having a hard time getting the shutter speeds I wanted, so I added a variable ND filter to the polarizer. I was able to get my shutter speeds, but wasn't happy at all with the compositions I was coming up with. After about a dozen frames, I gave it up and packed the camera back up again. I was pretty sure that I was spent, and all my creative energy was expended. I continued on down the trail knowing that the parking lot wasn't too far off from where I was. I was tired, and I was ready to get home. While I was walking, I was thinking back to a November trip to this very trail a few years ago where Toni and our daughter joined me for a snowy hike. There were a lot of good memories from that hike, but one of them was a tree that was along the bank of the stream with a really interesting root system. I remember trying to photograph it several times before without success. 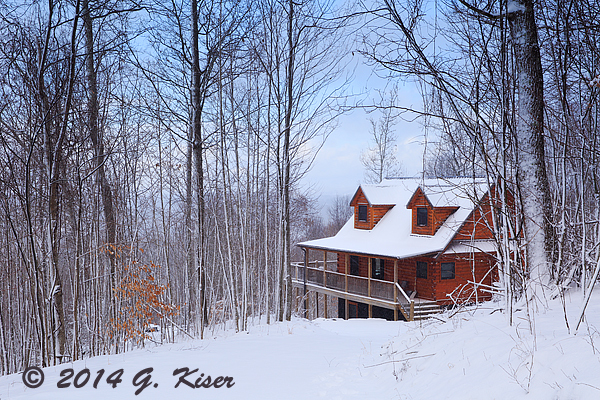 On that day, with a light snow covering, I was able to capture an image that I did like for once. I was wondering what it would look like today. I was even wondering if I had passed it already. Almost as I was thinking that thought, I saw it off to my left. It lacked the visual interest of the snow from the last time, but there was something about it that warranted a second look, and possibly a frame or two before leaving for the day. This was the view that I had as I approached the tree. You can see the roots very easily, and you can immediately tell that this is an odd tree. My creative juices were once again flowing, and I wanted to capture this tree again. I decided to drop down to the water in order to capture a different perspective than I had previously. 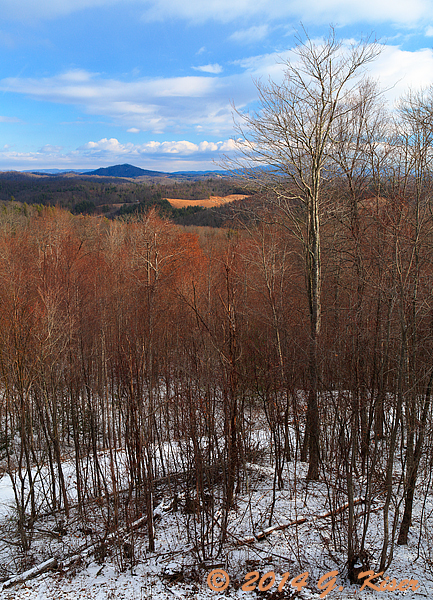 I kept the 24-70mm lens on the camera as well as the intensifying polarizer to help saturate the colors in the woods. 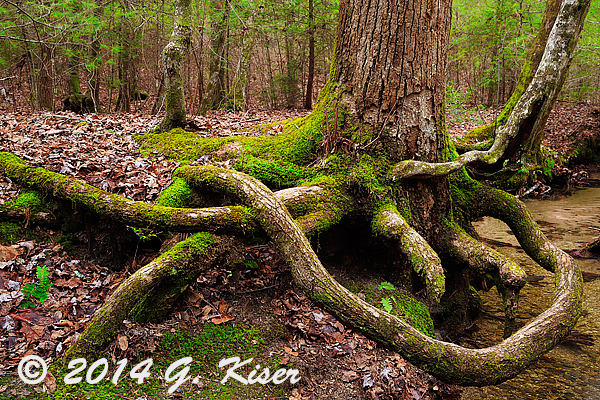 I framed my first shot using the tree trunk as an anchor for the stream. This lacked punch, and had no clear purpose to my eyes. I altered things, and flipped the camera vertical to accentuate the tree. Again, there was no clear purpose to the picture. The roots were getting lost. 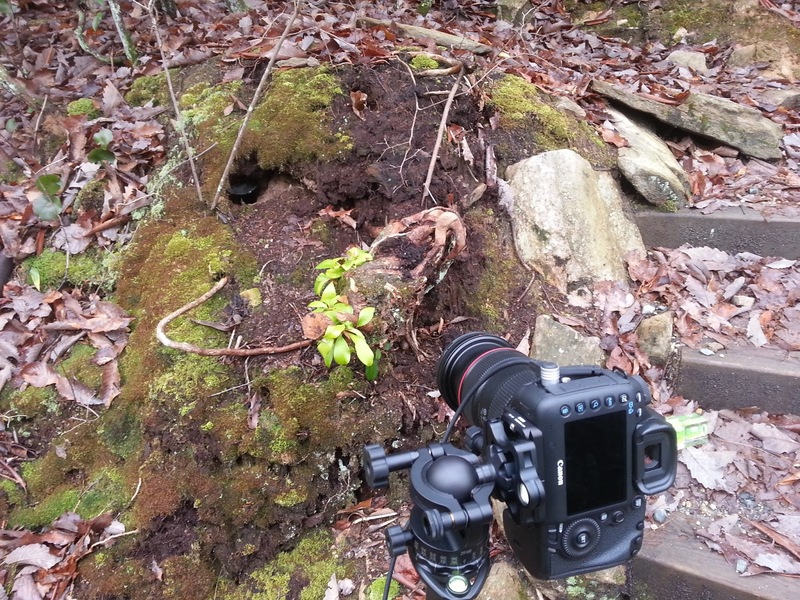 I returned the camera to the horizontal position and framed just the root system. Whoa buddy!!! That's the ticket! This was what I had been looking for with this tree. I don't know why this composition eluded me for so long. it was a natural one! 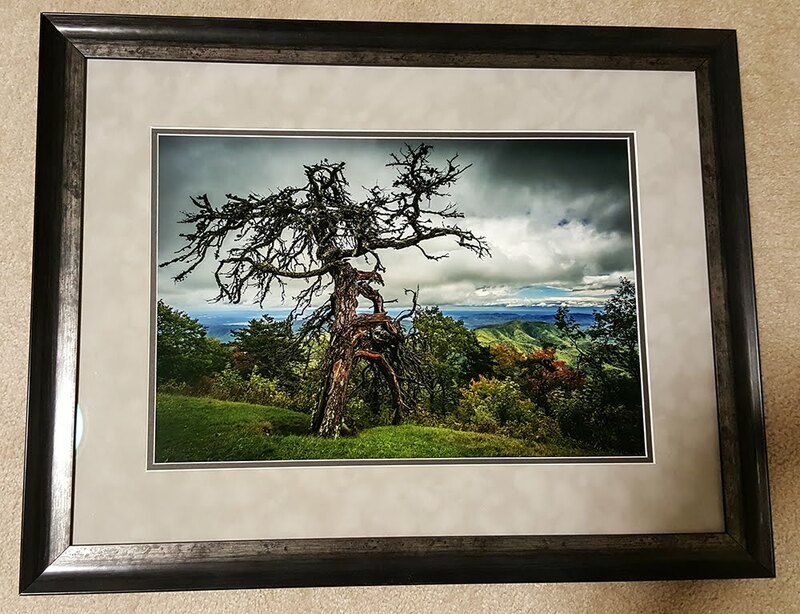 It showcases the roots, which were my inspiration for the picture to begin with. Secondly, it allows me to hide the odd offshoot trunk on the right side with a tree that is growing a little further down the stream. In the picture, they look like they are one and the same, reducing visual clutter. 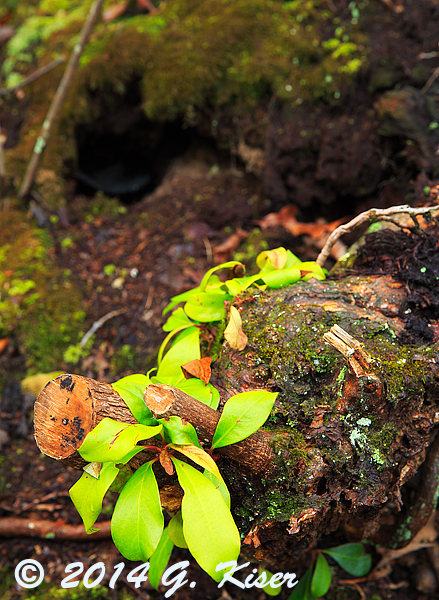 The emphasis is on the roots, and the color comes from the rich moss which adorns the tree. I have to say, this oddball tree is my favorite image from the day, and after a quick review, I think that Toni agrees with me on this one. I had a bit more pep in my step now, and my creative energy had returned, but I was still nearing the end of my energy reserves. I decided to make one last stop on the way out. I knew that I had to pass the Hutchinson Homestead before getting back to my truck. I knew of a really cool tree there which I have shot a number of times in the past. I wanted to give it another go today. I was after all, having a lot of luck with trees. As you can see, this tree is a very strange one, in a beautiful kind of way. What I love about it is that when framed just right, the distant cabin fits nicely under the limbs. The fact that it was overcast didn't bother me one bit since the backdrop for the scene is Stone Mountain and you can't see the sky if the image is framed right. The clouds also would help keep highlights down to a minimum, and would unblock shadow details as well. Keeping my 24-70mm mounted, I found the right point of view that placed everything in the proper perspective for my vision. It took some work, but I finally found the perfect shooting location, as well as camera height. Everything came together and I was able to create my favorite image from this location ever! I struggled with the title for this one a little bit. After several minutes of batting around different ideas, Torment and Comfort popped into my head and hit me like a ton of bricks. Since Toni and I plan on retiring to a cabin in the mountains because we both feel like they are very relaxing, the comfort of this picture really shines through to me. On the other end of the spectrum is the tree. It is twisted, torn, and mangled. I think its safe to say that this old tree is definitely tormented. Since I really enjoy a certain dichotomy in my pictures, the title just came together and ultimately "made" this image. That pretty much wrapped up my Trek. I had been in the park for about six hours and had shot an even 100 frames. I wasn't sure what I had, but I was really interested to see if what I had captured mirrored what I had seen at the time. 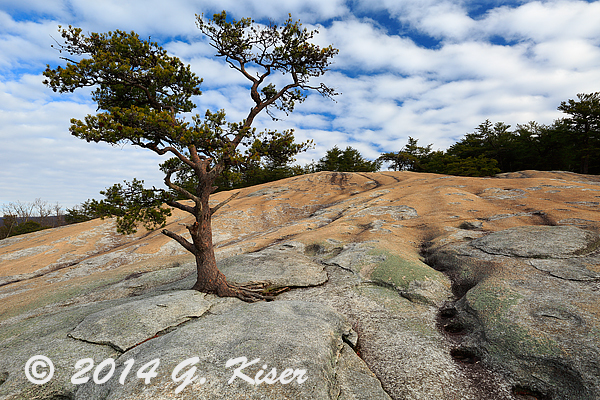 I'm pleased to say that the final images do justice to my visions from the top to the bottom of Stone Mountain! Be sure to check out images from other treks by clicking on the gallery links at the top of this blog. Where are those old Chevys? After talking to a friend of mine, I was all set to go out to the far side of Yadkin County to hunt out a pair of vintage Chevrolets. I had been told that they were possibly 50's vintage and set off of Reavis Rd, just North of US 421. Sounded easy enough to me to be able to find. It was about a 30 minute drive from the house to get out there, and based on how I read the description, they would be on the West side of the street which would hopefully put a treeline behind them. I figured that having the warm morning sun on them would probably be my best option for lighting. That way, if the trees weren't as I was expecting, I would have some nice open sky without a full overcast to mess with my exposure. I finally had the perfect morning with just light clouds in the sky. 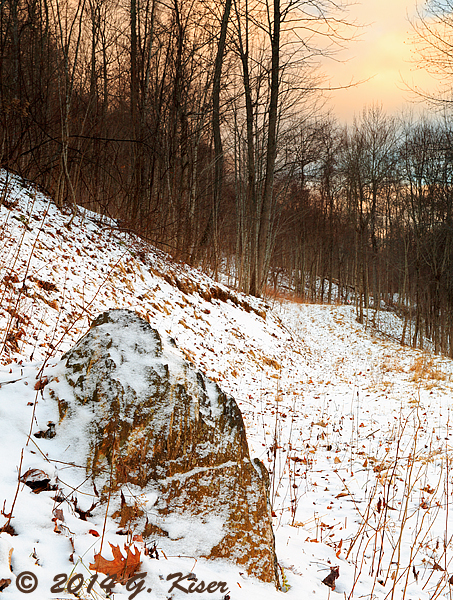 I set out in time to get there as the sun was coming up and starting to illuminate the ground. I was excited as I was driving down the road. The sky was doing just what I wanted it to. The clouds were awesome, and the blues were intense. I was just about to Reavis Rd and was already looking at the sides of the highway for other options just in case the cars weren't what I was hoping for. I exited, and turned North, looking very intently on the shoulders where I thought that the cars would be located. Nothing.....I could find no vintage cars at all, much less two 50's vintage Chevys. I drove all the way to the end of Reavis Rd, and came back, crossing the highway looking on the other side. Still......Nothing! I'm starting to make this a habit now. Seems like everything that I go out planning to shoot is either gone, or I'm unable to get to it, or some other problem has popped up preventing my chance to photograph it. This trek was turning out to be very similar. I was unable to find the cars at all. I had been all around looking for them, but to no avail. The sun was climbing higher in the sky, and I knew that I was running out of time. I could either keep looking for the cars, or I could go off in search of something else to shoot. I opted for the latter, and decided to go venture out in this uncharted area to see what I could see. There was a lot of potential out here since it was all rural farmland, but I wasn't able to find that "right" scene that would allow me to make a strong composition. I was starting to panic and came to the conclusion that I had wasted a morning that I could have been at home with Toni. I was just getting to that point of turning around and finding the highway to head home when I saw a barn with a tractor inside of it. I could see potential in it, but knowing that my 70-200mm f/2.8L lens was currently in Virginia having an issue resolved through Canon, I didn't think that I had the focal range to be able to isolate the barn the way I needed to from the road. In addition, the sun had not hit the barn yet so the lighting wasn't right anyway. While I considered the compositional options for this subject and my limited equipment, I continued on. As I was driving down the road with a renewed hope I happened to glance out of the corner of my eye and saw a nice field with a little barn set at the fence line. The sky was nice and blue behind it, the sun was casting a nice side light, and there was lots of room to pull off of the road. I quickly found a place to get turned around and headed back for a closer look. When I got back there, I could see that my initial ideas for compositions were a little too broad in scope. I reduced my vision and simplified what I was looking at. I went ahead and pulled the camera out and mounted it to my tripod with the intention of working the scene as the sun was getting a little too far along in its track for me to think I had any other options. I went ahead and fit my new Singh-Ray warming polarizer to my 24-70mm f/2.8L which allowed me to deepen the blue in the sky while warming the earth tones at the same time. I was interested to see how this filter would work as I had never used one before. With everything ready to go, I started walking out to the barn and the pasture. My first exposure was the vision I had from the street that included the barn above and the pasture behind. I could tell in the reviewed image on the LCD that there was very little visual strength to this image. I needed to work out some other options, but I was liking what I was seeing. I chose to work the barn first, and made many different compositions because the exposure was working out perfect with the lighting. There was just no need to bracket the exposure at all, so I got to move around instead. The barn was set in a place that made for some difficult compositional choices, but I found that it had the character that I was after and I worked a lot of different angles before I was satisfied that I had the best views possible. I then started to look around for other potential subjects. The field lacked a certain something and no longer caught my eye. 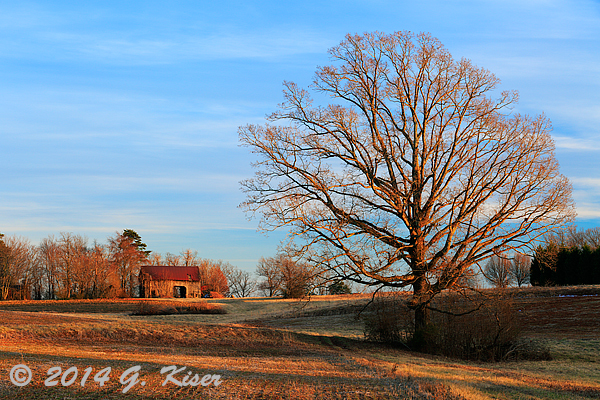 However, the old house that was on the side of the property was looking very good in the warm early morning light. There were some old trees in very close proximity to the house which also caught my eye. It really is amazing what a little light can do for a subject. The house had not really stood out before, and just looked like any other house. However, when the sun got high enough to cast the warm light on the siding it became electric. My eyes couldn't look away from it. The trees were a wonderful golden brown when viewed through the new polarizer as well. I had something special with this house. As with the barn, the exposure was a simple element in this setting. Everything fell into the proper values without any real work at all. That left me all kinds of time to play with compositions and to see what worked the best. 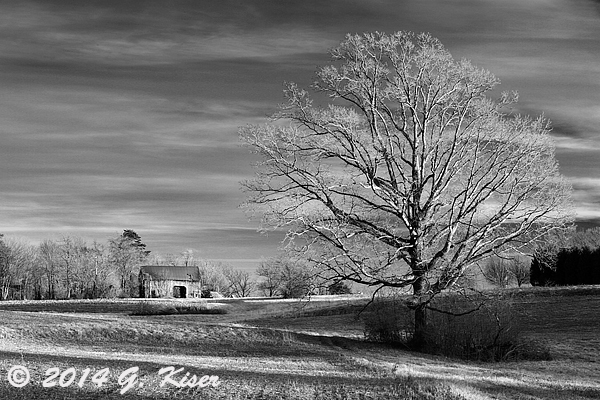 The house was awesome all by itself, but the bare tree standing beside the house really spoke to my landscape soul, so much in fact, that I decided to make the tree the focal point of one of my compositions. I shot from low to the ground to emphasize the size of the towering tree. The blending of colors and the engulfing nature of the limbs made this a success, and I found that it was one of my favorites from the day. Yep...this is my third image of this house. That is how much I liked it, and appreciated the quality of light that I was working with. 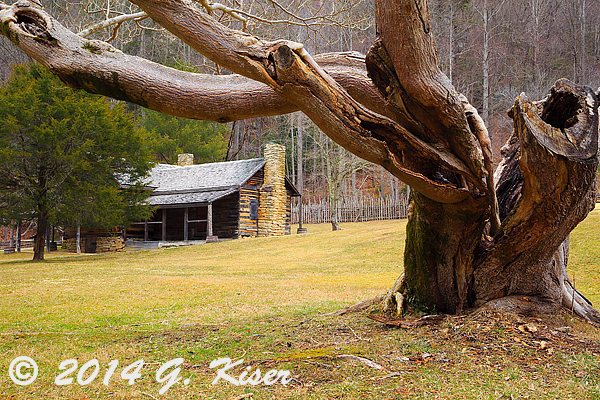 I restricted the composition yet again to emphasize the house and use the single tree as a strong supporting element. While it is similar to the other two, actually combining them both in a way, I feel that this one also has a voice all its own. What the voice says to me is generations of children used to run out of this front door to go and climb the tree. I could see the tree being small enough at one time that little Johnny would start climbing on it, and it would sway under the weight of the 10 year old. After I had worked out all the compositions I could think of with the house, I went back to the field that drew my attention in the first place. I wasn't sure what I was hoping to find, but I thought that maybe the quality of light had changed sufficiently enough so that I could do something with it. Sure enough, the ground was now bathed in a warm light from the still rather low sun, and the clouds were starting to come in with a pattern and texture that really complimented the field. I still had to work out a composition here that I liked and one that would convey the beauty that I was seeing. I looked at the old barn again, but that just wasn't it at all. There was a small evergreen tree set off by itself that was promising, but I just didn't really like how it was relating to the field behind. It was just wrong. Then I saw a bare tree off to the side, a side of the field that I hadn't even considered working before. I had Toni's voice in my head saying "get that tree...yeah, that one right there." I listened and started to frame my shot. Again, the exposure worked out perfectly so I didn't need to worry about bracketing anything which left me time to move around in the scene. I started very close to the tree using a wide focal length on my lens which really made the tree stand out, but the field in the background was out of proportion. I then moved back, framing the scene at about 35mm. I raised the camera as high as it would go which allowed the distant hill to appear even more elevated. This was pretty good, it kept the tree dominant in the scene and allowed me to frame a distant patch of trees as a counterbalance. I thought that this was the right image, but I again backed up and set the lens at about 65mm. I thought that this was the best image, but upon closer examination the tree was just too diminutive in comparison and it didn't work. I was so happy with how this image turned out, I gave it a try as a monochrome rendering. With the clouds in the sky, and a digital red filter applied, I was able to darken the sky, adding punch to the clouds, while accenting the field. 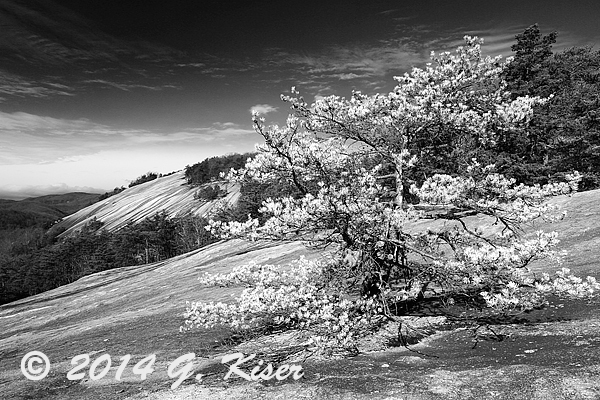 I thought that this was a very good candidate for a B&W image when I looked at the final rendering. I liked it so much, in fact, that I decided to keep both the color and monochrome for the gallery. After shooting the field, my lighting was about gone and the blue color cast of late morning was starting to seep into the scene. It was time to pack it in and head back to the house. Considering I had come out here initially to capture a couple of old cars, I think that I ended up with a more diverse setting as my plan "B" and am actually happier with the outcome than what I was anticipating with the vintage Chevrolets. Chalk this one up to a successful trek, and a very fun one as well! Be sure and view the links at the top of this blog to view my complete collection of images in each of the rooms. Winter is here, and is starting to take its hold in the Southeast. While not the single digits like it is supposed to be tomorrow, it was rather cold all day long and the temperatures kept on dropping as the day went on. The early morning clouds and drizzle were a little too good to pass up photographically speaking though. Looking at the weather, I had a window from about 8am till noon where I could take advantage of the really good lighting. The trick was....where to go? I had a lead on a couple of old 50's model cars on the other side of Yadkinville that I'm pretty sure would have benefited from this light, but after having spent a good portion of my more recent treks shooting old cars, I opted for something a bit different. 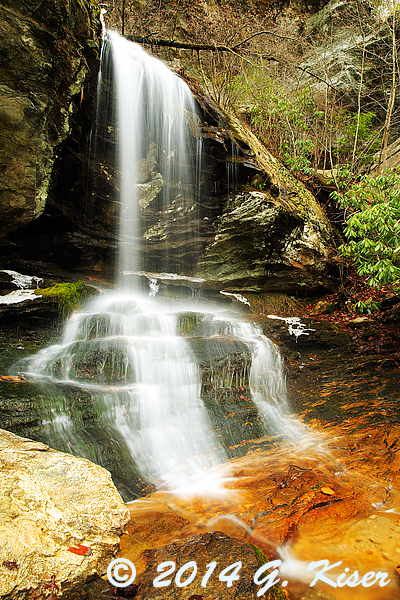 I was wanting to work waterfalls, which I have only tinkered with in this photographic rebirth. I opted to go to Hanging Rock for a couple of primary reasons. First of all, it is close so I would not waste valuable daylight getting there. Second of all, There were still a few falls in the park that I have not photographed recently that will have benefited from the recent rains that we have had. It wasn't going to be a grand trek by any stretch, but I was still looking forward to it. My plan was to head to Hidden Falls first because it has always been a favorite of mine. While I was there, I would go a little further down the trail to get to Window Falls which isn't one I typically care for, but its close to the other one so I might as well check it out while I'm there. I started out early enough and made my way to the park shortly after the gates opened. I was the only person other than the rangers in the park....just the way I like it. I got parked and loaded up with my equipment before starting the relatively short hike to the first waterfall of the day. While I am not as interested in waterfall photography at this stage in my life, I still get a thrill heading out to one. It brings back all the memories of when I was known for my waterfall photography. Starting in late 2006, I answered the "call of the waterfall" and sought them out near and far. I can't remember the count of waterfalls that I had photographed, but I quickly built a section of a portfolio based solely on moving water. These days it isn't about finding and photographing as many waterfalls as I can, its about creating the quality images that convey what I am thinking and feeling at the time. Today, I was feeling the moving water, and that was what I was going to capture! My first stop was The Hidden Falls which I've seen in various states before. I've seen it with just a trickle of water coming down over the ledges, I've seen it encased in ice, and I've seen it with a good amount of water moving over the rocks. I was expecting to see some ice today after some of the cold that we have had, but apparently, the above freezing temperatures overnight thawed out the ice. That worked out just fine by me since the water flow was the highlight of this waterfall today. Having worked this location several times, I knew where the best vantage points were and started with those. I made adjustments until I was able to see my vision popping into the viewfinder. I started with a horizontal composition which gave a sense of relaxation to the whole scene, and provided a better sense of scale. One thing that I have learned about waterfall photography is that they do generally suit a portrait orientation. I moved around slightly and found the proper location and I flipped the camera on its side. The driving force in my adjusting of the composition was the small plant in the upper left. Had I maintained my original position, I would have lost this much needed pop of green and a balancing element to the primary drop of the water. A shift of about 3 feet to the right allowed me to get this composition, but it introduced another problem...a tree was to the right and now there was a limb in my way. I had to get up closer by about 4 feet and use a wider angle of view on the lens. This allowed me to effectively shoot "under" the limb and keep it out of the composition. There is a lot of thought that goes into making these images, and many compromises that must be faced along the way. When photographing waterfalls though, I am in my element and able to summon quite a few tricks to make the images that I want. When I was finished with Hidden Falls, I was starting to walk up the stairs to head over to Window Falls when I found this odd little sight. I almost passed it by, but the hole in the ground caught my eye. Mainly because inside of it was a spider web hammock. I wanted to photograph it, but wasn't sure how to go about doing it. I decided to make a "macro landscape" of sorts. By getting in close, and using a 70mm focal length, I was able to isolate a couple of key elements. As I played around with the scene, I found that the spider web wasn't the most interesting part of what I was seeing. The leaves in the foreground kept assuming the visual importance, so I embraced that and worked out a composition that turned the spider hole into a mystery of sorts. In the final image, it looks like a cave in the distance, but it was less than two inches in diameter. I'm still not convinced that I like this image, but it does hold a certain amount of interest for me. If I was going to get any more waterfalls done today, I needed to get a move on. The sky was starting to clear and sunlight is the bane of waterfall photography. I loaded everything up and made the quick hike over to Window Falls. Now an interesting thing about this particular waterfall is that I have photographed it many times and have only once come back with an image that I was really happy with. 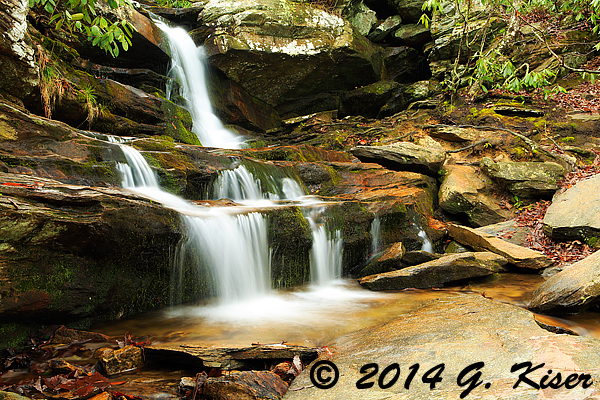 The water flow here is just so important to a successful image because of the design of the falls. Also, and possibly more important is that this waterfall is just very jumbled and a nice simple composition is incredibly hard to find. When you arrive at the top of the observation deck this is what you are faced with. You get a nice view of the waterfall, but it sure isn't picture worthy. 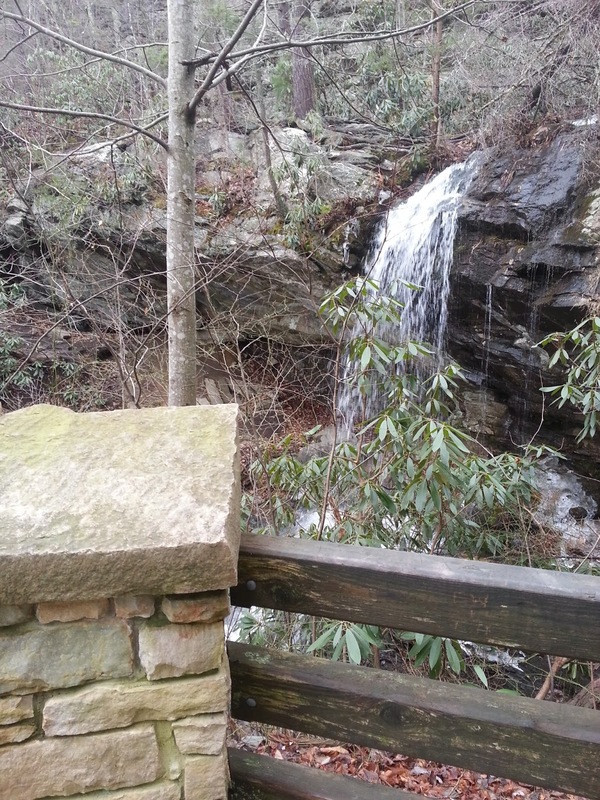 To get a good view of the waterfall, you have to continue down past the observation deck to the base of the waterfall. Even down at the base of the trail, you can see that there is very little to work with as far as composition. Usually, the best angle is to photograph it from this angle, only getting closer in. Today, I wasn't really happy with that. it was too done (by me), and I saw nothing special about what I was seeing. However, I was here, and I thought that I would spend a little time working this waterfall just to make the hike worth my time. I moved over to the other side, and I saw something that I hadn't seen before when it came to a composition. I guess it was the amount of water coming off of the rocks that really caught my eye, but for the first time, I saw real photographic potential here. I set the camera up in the middle of getting sprayed. I had to wipe the polarizer off before I started shooting because it had gotten so wet while I was picking my best spot to make the exposure. Before long I was bracketing exposures to get the right effect with the water. I didn't want it too milky, but I also wanted to avoid the choppiness of a short exposure as seen in my cell phone captures above. As I checked my LCD after each exposure, I could see that I was on to something with this angle for this particular day. I fine tuned my position several times until I was sure that I had all of the possible angles covered. I maybe shot a doze exposures of this waterfall, which was about 12 more than I thought it was worth when I first arrived here. I must say though, after this experience, I can now say that I do like this waterfall. It has always had character, but like the shy kid in class, was never really noticed. Today, the water was yelling out at me, and saying "look at me, look at me!" I'm glad I answered the call of the waterfall with Window Falls today. I had worked this waterfall as much as I could imagine, and with the sun starting to peer through the clouds on a regular basis, it was time to pack up and move along. While hiking back to the truck, I kept an eye out for any other potential shots that were wanting to be captured along the way. I found several downed trees that wanted to be photographed, but as is the continual problem with the woods at Hanging Rock, there is just too much ground clutter! I tried to resolve several different scenes without any success. Everything just felt forced, and I didn't want to have any photographs that felt "forced" from today. Thinking that I was done, and almost back at the truck, I happened to pay a little more attention than normal to the picnic shelters near the parking lot. 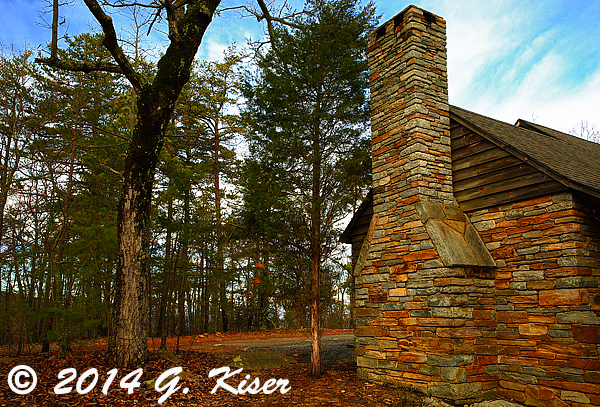 I have always liked the stonework and wood, but have never really cared to photograph a picnic shelter before. As I was walking behind one of them and looking up, I saw the blue sky with some nice clouds floating around. There were some interesting trees close by the chimney as well. In my mind's eye, I no longer saw this as a shelter, but as the side of an old home. It was time to bring out the camera and work some compositions. 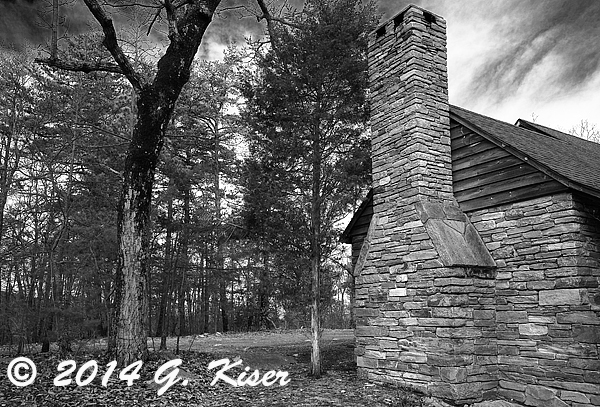 I started with a nice vertical composition to emphasize the chimney and the tree to the side. I really liked how the photograph looked in the LCD review, but I figured that there was more potential here than just that. I flipped the camera right side up and took several horizontal frames as well. 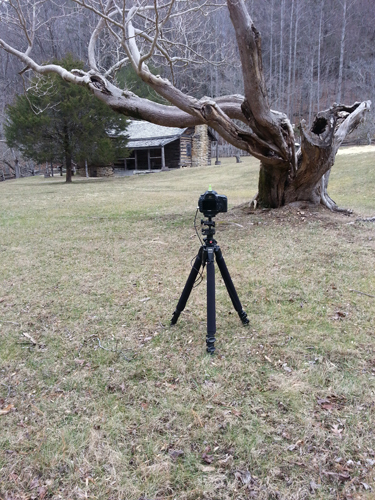 I had to position the camera in a different location though as where I was had too many branches in the way. I was also getting some very bad distortion due to the wide angle and being in so close. By backing up, I eliminated or reduced the visual problems with the composition. I still had all the elements that were important to me, and they all made sense together. As you can see, the sky was clearing and that meant that it was time to move on. I looked for some other subjects to photograph after leaving the park, but since it was getting close to noon, the lighting was much too harsh to even try. I did find a lot of new potential subjects as I took a different way home this this time. I have a handful of ideas for another day now, and I am looking forward to that next day. While I was at home, I found a couple of really nice surprises while I was processing the images from the day. 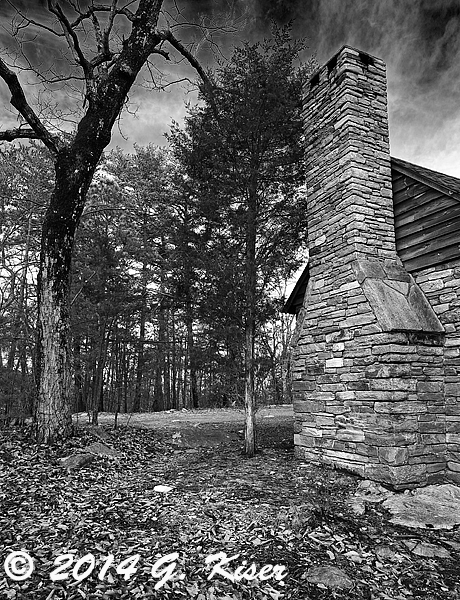 As I was working on the picnic shelter images, I happened to notice the tonal values that appeared on the final images. I had everything from black to white, and lots of very good contrast. This would make for an excellent monochrome rendering. 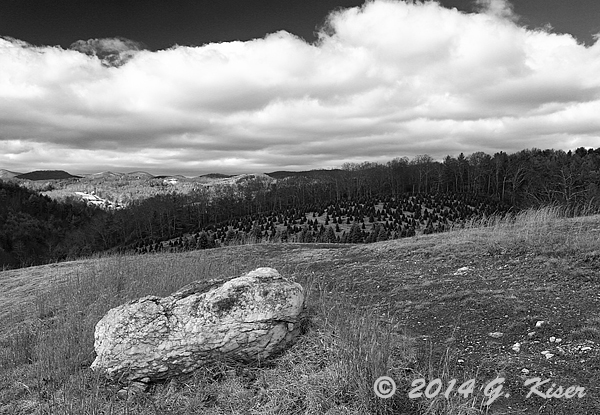 Shooting RAW affords me the ability to convert any of my pictures to black and white with relative ease. However, a good black and white image requires more than just the flip of a switch. It requires the right raw material to begin with. I felt that even though I had not shot these images with monochrome in mind, the elements were already there. I gave it a shot on Feels Like Home and was blown away by the results. Everything fit, and what is even better...the images work equally as well as color and as B&W. 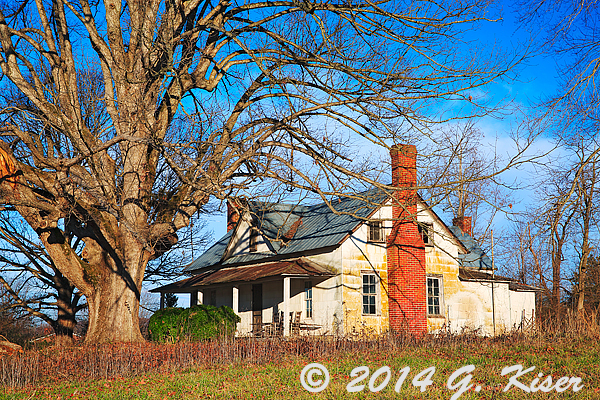 Because of that, they will both be appearing in my Rustic Scenes Gallery here.